Adjustable beds are distinguished by their ability to bend and support the body in a variety of positions, making them a great option from both a health and a lifestyle standpoint. The adjustable bed is also known by a variety of other names, including 'adjustable base,' 'power foundation,' 'positional mattress,' and even 'hospital bed.' The primary function of an adjustable bed base is to provide the ability to elevate parts of the mattress by bending the frame upward in one or more areas through the use of a remote control. Most commonly, an adjustable base will allow you to independently elevate the head and foot of the mattress to access sleeping or reclining positions that would not otherwise be possible on a flat mattress foundation. Couples with a larger bed (eg, King-size) may even opt for a setup that allows each partner to raise and lower their side without impacting the other person. In addition, modern adjustable beds have added many more robust features, including massage, positional memory, wall-hugger, under-bed lighting, USB ports, as well as many other differentiators -- described in more detail below. Can Any Mattress Work With an Adjustable Base? No, not all mattresses are adjustable base compatible. That said, these days adjustable bases can be used with a wide variety of mattress types, including the vast majority of memory foam, latex, and other foam mattresses, as well as most air mattresses and pocketed coil mattresses. Within this group though, some mattresses are more adjustable base friendly than others. Not all adjustable-friendly mattresses conform equally well to the curves of a base, and some behave weirdly when in a bent position or will break down more easily when used on an adjustable base. For this reason, GoodBed experts always include an assessment of adjustable base compatibility in each of our in-depth mattress reviews. If a mattress is adjustable base compatible, it will generally work equally well with any adjustable base. Although they are sometimes sold together as a set, an adjustable bed frame can typically be purchased independently from the mattress. So you do not need to buy an adjustable base that has the same brand as your mattress. What Is the Best Type of Mattress for an Adjustable Bed? In our in-depth mattress reviews, we have found that latex mattresses as a group tend to be amongst the most adjustable base friendly due to their flexibility, weight, and durability. All-foam mattresses, including memory foam mattresses, are also a reliable choice. Pocketed coil mattresses are more variable on this front but tend to work quite well overall, as do air mattresses. 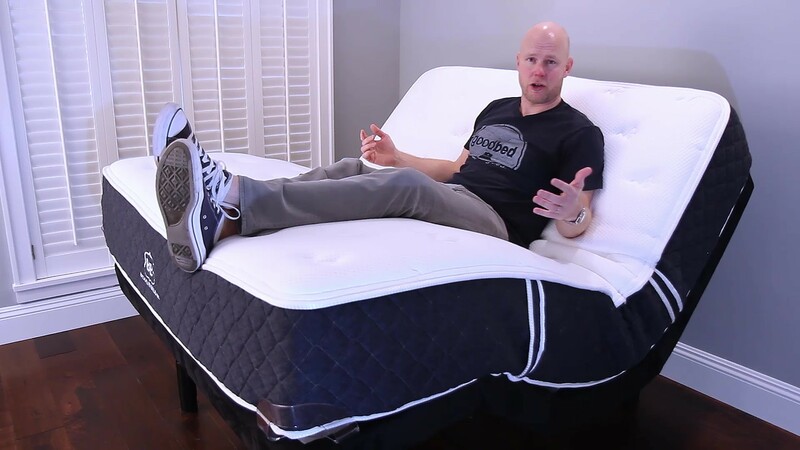 Do Adjustable Bases Ruin Mattresses? For a mattress that is not specifically designed to bend and flex, using it with an adjustable bed will cause irreparable damage. The majority of incompatible mattresses tend to be older or less expensive innerspring models that are made with connected coils or that use a border wire for edge support. In these cases, there is metal that runs vertically (head to foot) through the mattress. When the mattress is used on an adjustable base, this metal gets permanently bent and does not un-bend when the mattress is returned to a flat position, thereby ruining the mattress. Making matters worse, such mattress damage will not be covered under warranty, since that mattress was not designed for use with an adjustable base. Bottom line: Check with the manufacturer to ensure that the use of an adjustable base will not void the warranty or adversely impact the long-term performance of the mattress you’re interested in. Or check the product’s profile page on GoodBed and look for the note "Works with an adjustable base." What Are the Benefits of an Adjustable Bed? The benefits of an adjustable bed base span both health and lifestyle. From a health standpoint, elevating the head during sleep has been proven to help with things like acid reflux, snoring, and even certain types of sleep apnea. Likewise, elevating the feet is thought to relieve pressure on leg veins (especially helpful for people with weakened circulation) and to ease conditions like sciatica. In general, many back pain sufferers find it more comfortable to sleep in a more upright position (e.g., semi-Fowler position) with their knees slightly elevated, which tends to reduce stress on the lower back. As a general rule, if you are having trouble sleeping on a conventional flat bed, and find it more comfortable to sleep in a reclining chair or with pillows under your legs, then you may want to consider an adjustable bed. At the same time, today's adjustable bases offer a plethora of luxury and lifestyle benefits as well. Perhaps the biggest impact of an adjustable base is the versatility it adds to your bedroom. By adding an adjustable base, your bedroom becomes instantly more compatible with a wide range of other activities, including reading, watching TV, working on a computer, playing video games, and more. Meanwhile, massage features can turn your bed into a relaxing sanctuary, and features like under-bed lights, USB ports, and programmability all provide little benefits that promise to make your life a little easier in some way. Last but not least, more than a few of our readers have pointed out that an adjustable base can also help in the romance department, whether by enhancing favorite positions or even allowing you to access/invent new positions. Is an Adjustable Bed Worth It? In recent years, the rapidly increasing popularity of adjustable bases has led to a range of new market entrants which in turn has led to a wider range of product choices and a much lower cost of entry to the adjustable base universe. While a top of the line base with the best functionality and coolest features will still run you between $1,000 and $2,000 (queen size), head-up only bases now start just beyond the cost of a flat foundation, and richer feature sets now start in the $500 to $1,000 range (queen size). Given the increasing array of benefits that adjustable bases can offer, these decreasing costs will certainly mean that for more and more people, an adjustable base will indeed be a worthwhile investment. What Is the Best Adjustable Bed for the Money? GoodBed has published video overviews of several adjustable base units with varying prices and features. Reverie makes a large number of models. Here's our review of the Reverie 9T, one of the their most fully featured bases. The Leggett & Platt S-Cape 2.0 also has massage features, a lighted remote, and wall-hugger abilities. A basic adjustable base, the Serta Motion Essentials III is put through the paces in our review. The Saatva Lineal Adjustable Base is a step up, with massaging features and wall-hugger design. What Features are Available on Adjustable Beds? Pre-programmed one-touch positions -- buttons for Zero G, Flat, Anti-Snore, etc. Who Makes Adjustable Bed Bases? Most higher quality adjustable frames are actually made by a small handful of manufacturers, such as Reverie, Leggett & Platt, Ergomotion, Craftmatic, Electropedic, and Flex-A-Bed. Oftentimes, a mattress brand will sell adjustable bases under their own brand name, and in such cases these bases may feature unique designs that distinguish their models from another brand's. Below: GoodBed testing a mattress on our adjustable base unit. Do You Need a Foundation for a Mattress?